“Yet another dragon story”, I told myself as I gazed at the cover of “The Dragon Dimension – Caught In The Dragon Cove”. I will read this book because I told myself that I would do book reviews. I sit down at my computer (I have the desk top Kindle reader) and begin reading Ressa’s book. Page one, page two…now on page..I didn’t know. I was at 15%! In moments, I seemed to have begun, and steam rolled through 15 % of the book. Why? Because this book is interesting and fun to read. Why? Because Ressa wrote a book that dares to be different! I am not sure how Ressa Empbra did it, but she wrote a Fantasy novel that stood out. “How wonderful”, I thought to myself that someone figured out a fresh and original way to tell this kind of a story. Iax ( pronounced eye – axe) is the adopted daughter (I suppose) of a seasoned C.I.A. agent and his wife. They had not been able to have a child of their own. One day, a younger agent, (Fred) came to the seasoned agent and his wife with a surprise . Fred was clearly star struck by the experienced agent as he fumbled about at their meeting. Finally, when all of the fumbling around was over, Fred presented the agent and his wife with the surprise – a baby girl. The baby looked beautiful, and to the unknowing looked like any baby about 14 days old. But the surprise was not over. This baby was not from this world – was not from this dimension. Nevertheless, the new parents were thrilled to be at last blessed with a baby. The only question that remained was – would she always be just a human, or was there something more? Time will tell, as the story follows her. 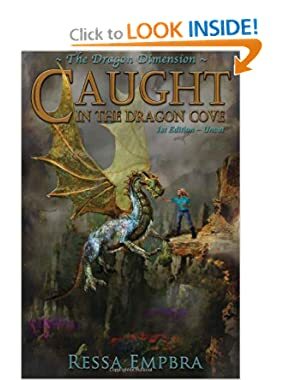 “The Dragon Dimension – Caught in the Dragon Cove is an exciting and original story that peaks the readers interest and keeps their interest throughout the read. The characters are believable, cogent and interesting. And the best part… She sets you up perfectly for the next book. For Ressa Empbra, this first novel is a success! This book is a must read for all of you out there that like traveling in different dimensions and exploring various realms within those dimensions. As for me…well I still won’t read these types of books – unless Ressa writes them. I think I have taken a sample of this book. If not, I will get one to try it out, thanks for your review.